Replies: 107 (Who? ), Viewed: 53707 times. #1 24th Dec 2015 at 5:15 AM Last edited by heaven : 14th Jun 2018 at 11:51 AM. I've been working on this world on and off for about three years now. When I started I had pretty much NO experience with CAW other than fiddling around with Riverview Lite for a little while. Instead of starting small, I decided to go all out and learn as I go. It's taken awhile but I am finally coming into the ending phases of the project. There's still some work to go but I wanted to (finally) create a thread so I can get some feedback, both on what I have with pictures, and once I am ready to put up a public beta. If you follow me on tumblr, you've probably seen all of this already. Greymont Bay was founded by a distant Landgraab in the early 1900s. For a a couple of generations, it was mainly a destination for summer holiday trips for the Landgraabs and their wealthy acquaintances and colleagues. As the years went by, the scenery and charm attracted more and more people. Soon enough, many people opted to stay year round. Though no longer exclusive to the wealthy elite, Greymont Bay has retained it's quaint, small town feel, partly in thanks to the Historical Society that protects many of the local buildings downtown from modernizing. This world is loosely based off of Bar Harbor, Maine. It's a small coastal town with a charming and quaint town center surrounded by nature galore. As a northern town, I've spent a lot of time testing the world in fall (especially fall) and winter to try to make sure it looks good as the leaves change color and minimize the blegh effects that sometimes can occur in winter. There is a lot of natural beauty throughout the world: forests, lakes, shores and more than a dozen waterfalls. The town prides itself on keeping its land and waters pristine. Cycling and hiking are past times for many of the residents. With the nearest large city a little over an hour away by car, if you travel the speed limit, the town lacks diversity in nightlife and big entertainment. However, they more than make up for that in outdoor activities. There are a lot of job opportunities for scientists of all sorts between the local aquarium and conservatory. Being Maine, summer isn’t much of a season; when it comes, it’s fairly mild and never lasts long. Ideally, Greymont Bay would have longer autumn and winter seasons, followed by a medium spring and short summer. I haven't worked on custom lighting yet but, when I do, I am planning on having foggy mornings, or at least days, make a semi-regular appearance. Some other notable areas of interest are a small military base and a small farming community with a winery on the bluff. #2 24th Dec 2015 at 5:15 AM Last edited by heaven : 6th Jan 2016 at 3:35 PM. What are your next steps/ what needs to be done? Right now I have the beta out to a few people as a test to see if there are any glaring issues I missed. It's totally possible. After that (and fixing any of those big issues), I'll be releasing a public beta. Time schedule for that is about two weeks. In the interim, I need learn how to do INI files, fix lot tears and finalize lot details like addresses. That middle one is the bane of my CAW existence. Anyway, really looking forward to seeing this progress. I'm not sure if a scaled version is considered enough of a mesh edit to be alright to use or not. Would have to check to clarify. However, despite you being right about the sizes, I'm not sure if a smaller one would almost disappear into the trees. Decisions, decisions! I doubt EA cares at this point though, especially if you also texture the lighthouse on top of that. heaven -the world is lovely! I live in New England and your screenshots are very evocative of the feelings and scenery of living here. I especially like the downtown and farmlands. #11 31st Dec 2015 at 5:22 PM Last edited by heaven : 31st Dec 2015 at 7:09 PM. Thank you everyone for your kind words! I've been getting some testing results back. You can find a whole lot of the posts about it on my tumblr from the current closed beta test. Editing to add the tumblr post from one of my testers: Jesus the water dog! I especially like the shaping of the terrain, your choices of terrain paints, and the care you took in applying them. It's realistic, and it's got a lovely atmosphere. I'm so pleased to report the first beta test has gone really well. Other than the water walking, the other main issue is lot tears which I can fix and the graphical glitches in certain areas from snow (which as far as I know, I can't fix). 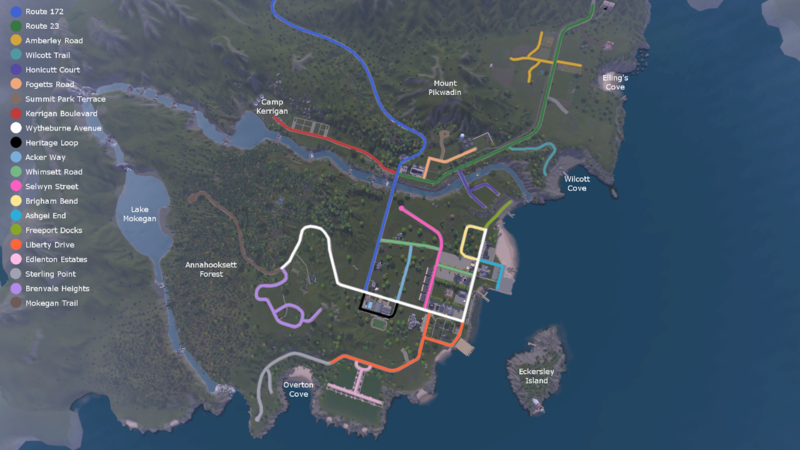 I have finished naming the roads and streets. There is one road I might change - Ashgei (pronounced ash - like wash, gay). It's a bastardized version of the Algonquin word for lobster - ash�ge (uh-shah-gay). Being Maine, I thought lobster would be quite appropriate and the aquarium / marine science station is located on that road. The last map shows the routing of the world. All the yellow areas are camera non-routable and the blue are sim non-routable. There is additional blue painting on steep hills (some of the rocky coasts, around Eckersley Island, etc). As I fix lot tears, I will be assigning lot addresses to each. That will take a little while but after that's done expect a public beta. It will probably be complete devoid of buildings, unlike the pictures shown above. #14 6th Jan 2016 at 3:31 PM Last edited by heaven : 6th Jan 2016 at 5:49 PM. The map is empty, mostly. There are a few lots that have some stuff on them, parking lots, etc, that I copied from WIP lots that were included previously. All lots are, at this stage, incomplete. There are no spawners yet. I know there are issues with snow in a few places. As I mentioned in a post above, I do not believe I can fix that. *Some lots might have minor lot tears, particularly the sloped lots on Freeport Dock Road. I have attempted to fix those to the best of my ability but I don't think they'll ever be completely free of them. Jesus water walking - don't know how to fix this but would welcome input if people have any. Generations, Seasons, and Showtime are not required at this time. I won't be taking them off the list until all the lots are built and I know for sure. At this time though, nothing from those EPs should be missing. There is a default replacement for the dark dirt base game terrain paint for this world only. The thumbnail still looks like the normal thumbnail. I will be (I think anyway) removing the default replacement and just adding in custom terrain dirt and base grass that matches the world should anyone want them for landscaping. I made most of the CC for this world (matching terrain paints, lamp posts, etc). I also edited Moria's simlish stop sign. All of these items are included. You will need to download the retaining walls from Simsimillian. That's the only other CC required. 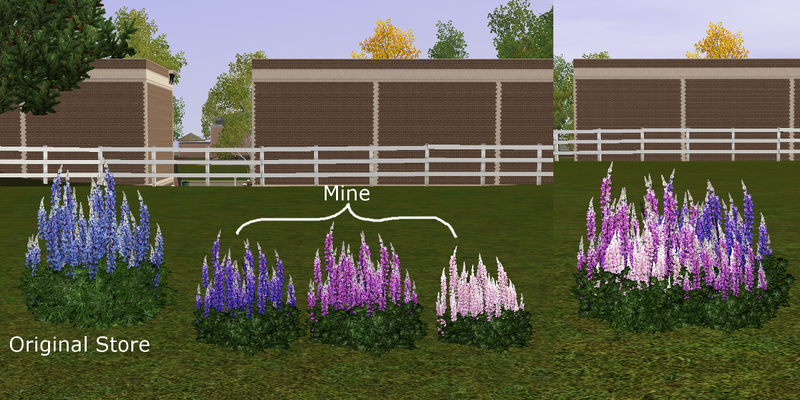 I made 3 custom lupin plants that are scaled versions of the lupin from Aurora Skies (but do not require it) that I have not used yet. Would this be something you would want to see in the world, as extra custom content? Addresses - do all lots have them, does the spelling match? #15 17th Jan 2016 at 12:05 PM Last edited by Fergus' Mind : 17th Jan 2016 at 1:05 PM. I found an address issue; over on 'Summit Park Terrace', no. 85's address is 'Summit Park Road', where as the rest of the lots there are listed as 'Summit Park Terrace'. But other than that, the world's looking gorgeous. #16 24th Jan 2016 at 8:43 PM Last edited by heaven : 24th Jan 2016 at 9:37 PM. Below is a collage of a few different times for Greymont Bay's lighting. All the pictures are fairly decent recreations of real lighting from different pictures of Maine. There are links to lots more pictures in this post on my tumblr. I'm really surprised, and pleased, that so far, I've not had any other issues crop up in town! I'm taking the lack of responses as positive notes that there isn't anything to fix. I want to take another pass tomorrow, but so far it all looks great! Beautiful world, and the lighting posted above is lovely. I would vote for including your custom lupin plants, or if not, please make them available as a separate download. 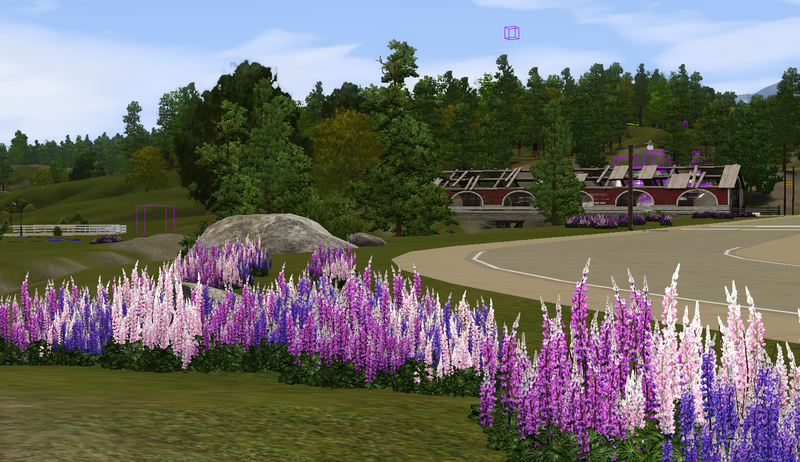 Okay, so I opened CAW for the first time in awhile today and added some of the lupin plants. I used them similar to how EA used them in Aurora Skies: densely clumped but only in a few rare spots in the world (only present in two chunks). I think they are just lovely and very reminiscent of New England. Okay, I finally went in and added the ranch weeds as suggested. @Nilxis is this what you had in mind? I've recolored the grass so it's not that putrid lime green as well. This looks so lovely! Great job on the Lupines!